Focus class time on bullying prevention. It is important that bullying prevention programs include a classroom component. Teachers (with the support of administrators) should set aside 20–30 minutes each week (or every other week) to discuss bullying and peer relations with students. These meetings help teachers to keep their fingers on the pulse of students’ concerns, allow time for candid discussions about bullying and the harm that it can cause, and provide tools for students to address bullying problems. Anti-bullying themes and messages also can be incorporated throughout the school curriculum. Continue these efforts over time. There should be no “end date” for bullying prevention activities. Bullying prevention should be woven into the entire school environment. Weave anti-bullying activities and concepts into the fabric of your day. - To motivate students to stand up for kids who are being picked on. * Stand tall with your head held high, feet apart. * Take slow deep breaths to keep your cool. * Act as if you’re totally confident, even if you feel nervous. * Keep your body language and facial expression strong but neutral. * Make direct eye contact. * Speak in a firm, steady tone of voice. * Walk away tall and strong, silently repeating a calming statement. 1. Use “The Dignity Stance” to stand tall to help others. 2. Partner up. Have a friend to join you to confront someone who’s bullying. 3. Use deep breathing to keep your cool. - Tell students that today they’ll be learning ways take action, and be upstanders for kids who are bullied. - Ask, “What are you already doing to help when someone’s being bullied?” Discuss. - Ask, “What stops you from helping?” Address kids’ concerns, emphasizing that each time we look theother way, we allow bullying to continue. - Go though steps 1-4 with students. Discuss each one and answer questions. - Now ask students what other steps they think should be added to the list. Write top choices on the chart. Jeffrey sees Tommy being bullied by Stewart on the playground. He asks Claire to partner up with him to help. They stand tall, breathe deep, think of words to say, and walk over. They ask Jeffery to hang out with them on another part of the playground. - Debrief with class. How did it go? Discuss how this can be done in real life situations. - Emphasize that each of us can help end bullying, and we don’t have to do it alone. If conflict among your kids the bane of your existence, you're not alone. As the mom of two boys, my sons and I were not strangers to conflict. 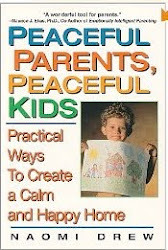 Bickering, fighting, put-downs, and the like can drain time, energy, and peace from any parent's life. 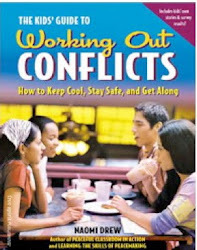 In fact many conflict among kids as one of the top stresses families face. If you've already tried intervening, ignoring, reasoning, and threatening to no avail, don't despair because help is at hand. What follows are five practical but highly effective steps to help you help your kids work out the conflicts that are driving you nuts. Best to use with kids 5 and up, but modifiable for younger kids. First, an important caveat. Try this process in your own life first. Then introduce it to your kids at a neutral time. Expect that your kids might be resistant at first. This is normal, so don't give up. The process below helped restore the peace when my boys were younger, and now that they're grown they still use it (even though they also resisted it initially). It's like learning how to ride a bike -- over time, it gets easier, and before long, it feels perfectly normal. 1. Have them cool off first. The number one mistake adults make is trying to get kids to talk out the conflict while they're still mad. You've probably noticed that this doesn't work. Think about yourself in the throes of anger or hurt - how impossible it feels to talk things out right away. Rational solutions require clear minds. Give your kids time to calm down before asking them to talk. Separately, have them take some time out, get a drink of water, or do something physical to let of steam. When tempers are calmer and tears are dried, sit down with them and go on to step #2. 3. Paraphrase what each child said. Hearing you paraphrase what was said teaches them how to do the same. As your kids get used to hearing words paraphrased, start asking them to "say back" the main idea of what each other said. Let them know that "saying back" doesn't indicate agreement, but shows respect, builds understanding, and makes it easier to work out problems. 4. Now ask this question: How can the two of you work out this conflict? Then wait. Don't jump in with a solution. If they're over five, they're perfectly capable of coming up with their own solutions. For younger kids, offer several suggestions for them to choose from. For kids over five, give them time. Walk away if you have to, and let them know you have faith in their ability to work out the problem in a fair and respectful way. 5. Have them tell you the solution they came up with. If it's is an ongoing conflict, write down the solution, have them sign it, and hang it up. Affirm them for working out the problem, and let them know how proud you are that they used their creativity and energy to make things better. Most importantly, let your kids see you working out conflicts in a similar manner. Modeling is your most powerful teaching tool. Also, let your kids know that you expect them work out problems in a fair way. By teaching them how, showing them through your example, then guiding them through the process when problems arise, you'll be preparing them to do this independently. You'll also be providing a tool they'll be able to use for the rest of their lives. Since the demand is so high, I am booking these workshops on a first come, first served basis. You can e-mail me at Naomi@LearningPeace.com, or call 609-397-8432. 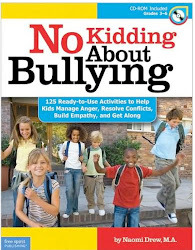 School Library Journal has named No Kidding About Bullying “an essential resource for preventing bullying.” It’s also a low-cost way of preventing and addressing bullying school-wide. For more some free downloadable lessons from No Kidding About Bullying, and for more information, click here. And now, read on to see what’s possible. No educator would ever say, “We’ve covered math this year. Our school had a great assembly, then every teacher did a lesson, so now we're done." Unfortunately that's what happens with the issue of bullying far to often. To prepare kids for their role as responsible members of our society – and to get them to stop harming each other -- it’s essential that we teach them how to treat others with decency and respect. Brutal incidences of bullying in schools across the U.S. have shown that we have little time to waste. So what can we do? The first and most important step is to be proactive rather than reactive. It’s not just about punishing kids who bully, it’s about creating school climates that are antithetical to bullying and other cruel behaviors. Kids want this just as much as adults do. A national survey I ran of over 2100 kids revealed that 73% of the kids surveyed believe their peers are somewhat to very mean to each other. A whopping 80% said they want to learn more about managing conflict, anger and bullying. The only thing that’s going to change schools from places with undercurrents of gratuitous cruelty to places where respect is the norm, is by teaching compassion, kindness, and acceptance as deliberately as we teach reading and math. These values need to be integrated into the very fabric of learning every day of the year. This has to be done in homes too. Schools can’t do it alone. Imagine every member of school staffs acknowledging kind acts as soon as they take place, calling kids on mean behaviors the minute they occur, and following up with a consequence -- no exceptions. Imagine weekly lessons taught on compassion and acceptance, and kids becoming upstanders for peers who are picked on after practice through role play. All of this is possible. Remember the days when smoking was considered cool? Then, after years of anti-smoking campaigns, kids finally got the message that smoking isn’t cool at all –- in fact, it’s downright damaging. The same thing can happen with bullying. Picture kids speaking up rather than joining in when peers are picked on, and all the social capital going to the upstanders, rather than the kids who are mean. The academic and interpersonal rewards that follow are beyond measure: “higher grades, engagement, attendance, aspirations, scholastic competence, fewer suspensions, on- time progression through grades, higher self-esteem and self-concept, plus less anxiety, depression and loneliness,”according to a synthesis of national data compiled by the prestigious Search Institute. Kids want our help. They want to go to school in an atmosphere of peace and respect. If we make this a priority, we can make it happen, and kids need us to make it a priority now. It’s time to move beyond bullying and cruelty. Let kindness be the new norm. 1. Listen to them and empathize. Don't minimize the hurt they've been through, but don't make them feel like a victim either. Hear them out, then ask them how they might want you to help. Encourage them to speak to their teacher or counselor, and see if they want you to reach out to them too. 2. Help them see their own strengths and personal assets. Is your child kind, funny, helpful, interesting? Remind them of whatever positives they have -- even write them down so they have a concrete manifestation of their pluses. Are they good at music, sports, math, or something else? Whatever it is, encourage them to spend more time on their areas of talent. Doing so will give them back some of the energy bullying takes away while providing a healthy outlet. 3. Keep the lines of communication open at all times. If they're spending too much time alone, do whatever you can to be there, stay present, and continue giving support. If they're depressed and withdrawn, take them to someone who can help, even if they resist. 4. Help them rehearse what they're going to say and do when they see the people who bully them. Role play and rehearse together so the assertive actions and words won't feel foreign to them when it's time to stand up for themselves. By the way, did you know that many kids who are picked on because of a physical "flaw" seek cosmetic surgery? It's a growing trend. To find out more, read my latest Examiner article.